Does your sales team feel like their role gets a little tricky and difficult sometimes? If you answered yes, I will let you in on a little secret... It’s because the buyer's job is easier than ever! Think about it…when you’re interested in making a purchase what do you do? If you’re anything like us your first stop is the Internet. In seconds you will be inundated with the products or services available, you can check out the competition, maybe compare prices and even check out a testimonial or review from people who have already bought in. That’s a ton of information and it’s all learned before a buyer even considers talking to someone on your sales team! Today prospective buyers are much more informed about what you are offering before they even reach out to you. In a way that’s great, especially if you are utilizing your website, your blog and your social media presence to be the initial sales person. However it also means that when a prospective buyer is finally in touch they have higher expectations in regards to your sales team’s role and how they are going to help them. That’s a lot of pressure! But having a strong sense of your companies sales goals can help keep the team focused and relieve any unnecessary stress. When everyone is on track and you’re meeting your goals it can boost the confidence of the team. This will be reflected by increased productivity and higher sales! And those are probably among some of the most important sales goals, right? We’re going to go ahead and assume the answer to that is yes. And with that in mind we are going to focus this blog post on 4 tips that your business can do to help set clear, concise sales goals that everyone on the team can agree on. And by forces we mean the sales team and the marketing team. Smarketing is not exactly a new idea, and has seen tons of success in the past few years. It’s likely your sales and marketing team already communicates on a pretty regular basis (or at least we hope they do) but being conscious about this communication can really help to align the teams and boost sales. Closed-loop marketing is a great way to help your marketing team see the whole picture. With this system in place they can tie every single lead and customer back to the source they were generated from. If you knew that every lead that you found via a particular landing page went cold almost immediately after you passed it along, would you keep sending them on to sales? This is not only a time saver for the marketing team but can benefit your sales team too! When the quality of the leads being passed along to them is greater, they won’t be wasting their time on leads that will never turn into sales and their conversion rates will increase. So even if you get some resistance when start talking about Smarketing, stick with it and explain the advantages. It’s really a win-win for everyone! Try this exercise: with a pen and paper in hand make a list of 50 sales goals that you have for your business. They can be anything, long-term or short-term, you name it! Once you have these 50 goals written down, break them up into time frames. Start by lumping together all the goals you would like to accomplish by the end of the week. Now it’s time to get specific. After each goal, list some clarifications of what exactly you want to do. For example, if your goal was to increase the amount of traffic to your website from Facebook, consider how you plan to accomplish this. What posts can you make that will link readers back to your site? Would offering an eBook be an effective offer? Do you regularly share your blog posts on Facebook? Are you using the right language to appeal to the reader? What types of content has proven most popular on that network? Breaking down your goals and clarifying points can make the task seem easier and help you not get hung up on bumps in the road. Continue this process with the rest of your list, breaking it up into daily, weekly, monthly, yearly and even super long-term goals. It’s okay to have a goal for 10 years down the road. It means you have to look at the big picture and have direction about where you want to see your business go in the future. While it’s essential to have this kind of long-term plan, shifting your focus to your short-term goals can be a more effective way to get things done. After all, your short-term goals should be steps to reaching your long-term goals and are a great way to stay on track. Instead, ask yourself if the short-term goals will help you get closer to your long-term goals before you start working towards them. When you are setting your annual target number it’s important not to set it too high or too low. You want to make the goal obtainable, but not too obtainable, so that you will not be discouraged when it is too difficult. More specifically, you will not feel unsatisfied because the goal was too easy to achieve. It sounds tricky, but a little research will go a long way and reveal what’s right for you. Look at past sales numbers and consider how long the sales process takes within your business. Getting feedback from other people on your team is also helpful and a great way to make sure everyone is on the same track. Review these goals frequently; talk about it first thing in the morning and again at the end of your day. Be honest about how things are going so far and make adjustments when necessary. We all make mistakes and while we seem to have no problem reciting those four words, getting specific can be the hard part. It’s not fun to admit to all the things you have done wrong in the past, we want to forget but in all reality we can’t. Here’s another thing we all love reciting: learn from your mistakes. But once again, it’s easier said than done. Where will we make changes? What sales goals have we not met? Why have we not met these goals? Putting an answer next to each question can be a great start to learn from your mistakes and may also reveal some things that you may have never considered. Have we inspired you to start setting some sales goals? 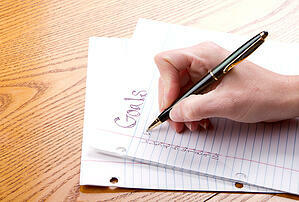 Do you have any other tips about goal setting that you have found effective? Share with us in a comment below!